Lanzhou is the capital of the Chinese Province of Gansu and lies in a narrow valley between loess mountains at an average altitude of 1517 m above sea level. The wind circulation is very low and the temperatures today are about 6-7° C warmer than the surrounding areas during the night (1). Lanzhou and Gansu Province in China. The local name of Apus apus pekinensis in Lanzhou is "Motley Swallow". The body measurements of the Common Swift or Motley Swallow are: length:171-180mm, wing:169-172mm, tail:74-76mm, tarsus:10-10.4mm, weight:34-36.5g. The nests were built of different material, the outer part of leaf, stem, root, plant material, while the inner part contained fibres, cotton, feathers, thread, wastepaper, and animal hair such as sheeps' wool or the hair of the Siberian Musk deer, Moschus moschiferus. The sizes were 80-105 mm in diameter and 10-25mm high. It was found that only one adult bird can sit in the nest at a time. 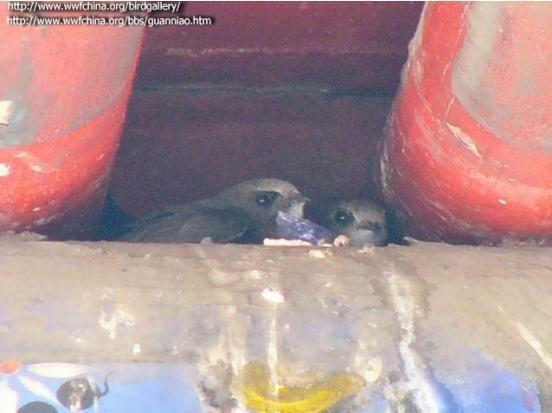 The Common Swifts mate from June 5 to June 9 and lay eggs from June 12 to June 20. The clutch size is 2-3 eggs. The size of the egg is 24-25 x 16-17mm. The incubation period is about 21-23 days. It was found that the diets of the parent birds and of the chicks were quite different. Five samples from different months were taken. Arrival and the departure dates of the Common Swift recorded during 1954 -1956 were similar. Some interaction with other species was recorded. Wang observed a domestic cat attack the young birds twice and a Sparrow was seen flying into the Swift’s nest to collect the residue of insects to feed its own juveniles. The nests of these two species were only 18 inches away from each other. When the Common Swift was feeding, the Sparrow flew near to the Swift nest and made noise so that some food dropped from the Swift's beak. Other threats came from parasites. The larva of one species of Coleoptera lives mainly on the body or shed skin and feathers. Wang checked three dead bodies of juvenile Swifts and found that there were holes gnawed by these insects in the birds' bellies. In 1956 the flight activities in one nest were recorded. Feeding the chicks is the period when flight activity is greatest.